I thought I would make a post on behalf of hectmarr to clarify the operation of his semi-automatic hybrid. The system is shown here ready to fire. The fuel/air mixture is retained by a spring, while the pressure from the compressed air reservoir keeps the chamber exhaust valve closed as well as the ammunition feed locked. 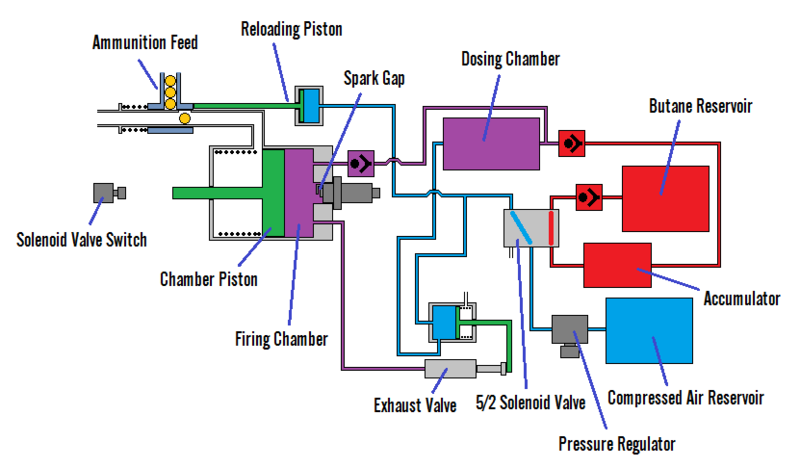 Pulling the trigger ignites the fuel/air mixture and the overpressure pushes the firing chamber piston forward, allowing the gasses to escape and fire the projectile in the process. At the end of this travel, this piston pushes a switch that temporarily actives the 5/2 solenoid. This shuts off the fuel (butane) feed while also venting the compressed air line. Return springs push the ammunition feed to the open position allowing a new projectile to load, as well as opening the chamber exhaust valve to vent any burned gasses. 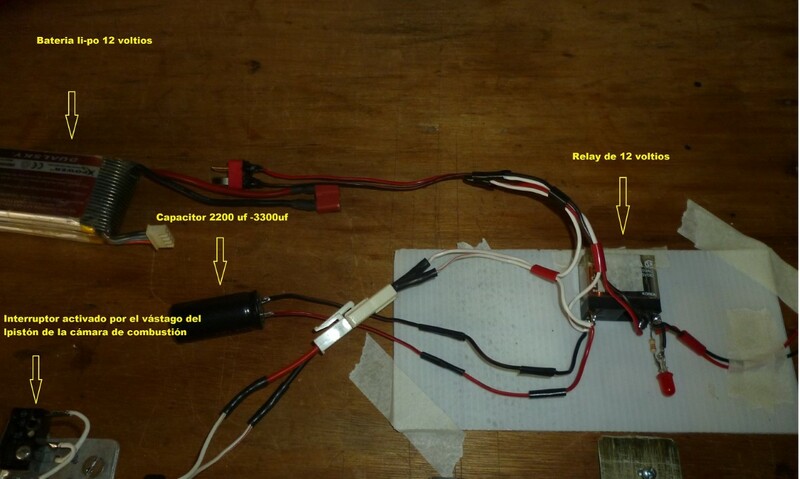 Once the solenoid is deactivated (through the operation of a capacitor relay) the compressed air feed is restored allowing the system to reset ready for another shot. absolutely awesome job, you did what I've always wanted to do, with what seems to be basic tooling and construction principles. Kudos! The biggest weakness of this design in my view is that lack of a "pop-off" element in terms of the firing chamber piston. This probably means that the piston moves far too early not allowing sufficient pressure to build up. The disadvantage of this system is that it does not allow the piston to compress the volume to zero in order to flush the burned gasses out of the chamber after firing, so you'd probably need a different way to purge it. An alternative would be a mechanical lock that would hold the piston in the intermediate position and then free it once sufficient pressure has built up. For inspiration one can look at the various systems used in firearms to delay bolt opening as the requirement is the same. I tell you the following. I have tried to regulate the opening time of the exhaust port so that it opens before or after. 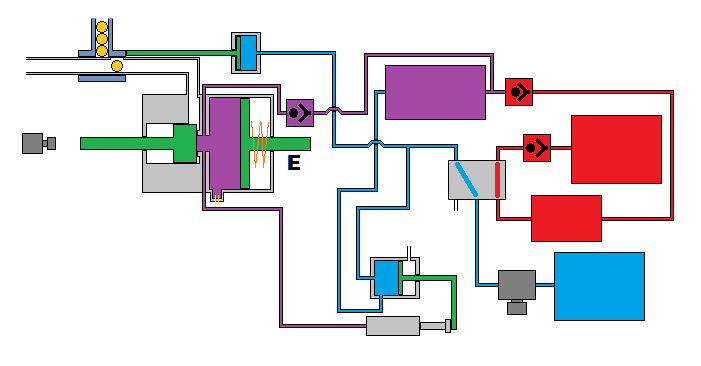 This is achieved by increasing or decreasing the washers, (in red in the diagram), which ultimately moves the piston closer to the outlet orifice. There are important variations in the energy of the shot. The best performances are achieved when it is two or three millimeters, that is, when it does not take long to open. The mass of the piston and spring have to do with this question. The amount of washers is always the same, so as not to alter the force that the spring makes, they are only taken from one side and put on the other, and the other way. On the other hand, the ammunition in the firing barrel, which is tight and seals well, retains the gases a little more. Shooting without the ammunition, only produces a soft "puf". When I insert the ammunition, it makes a strong explosion, and I think it is for this reason. I'm going to make a short video this afternoon so they can hear the difference. I conclude that to achieve the normal pressure peak in a hybrid, one must consider the combustion chamber, and the firing barrel seal, as unit. Only this way works. The opening time depends on the mass of the piston and the spring, the distance from the piston to the exhaust port. The further away, the later it will open. I have played with this. It is different with the rupture discs, which produce the peak of explosion pressure, with the combustion chamber alone. It's a good system that Jack shows here, it's a matter of trying, to try. I agree that using the projectile as a "burst disk" in a detent would probably be the simplest way to implement this. Any energy spent moving the piston is energy that is lost. The critical part would be ensuring that the projectile is more or less airtight so that no gas can flow around it. The green bolt could either work as a blowback mechanism powered by the shot or moved independently by pneumatic control as in your current prototype. Effectively. The system has that disadvantage that you make notice. The only thing that makes me consider it to use in these prototypes, is its incredible ease of construction, and the possibility of regulating some parameters. I have built a regulation template, (photo), and based on the program data to calculate the dimensions of the spring, I configure it to perform as best as possible. 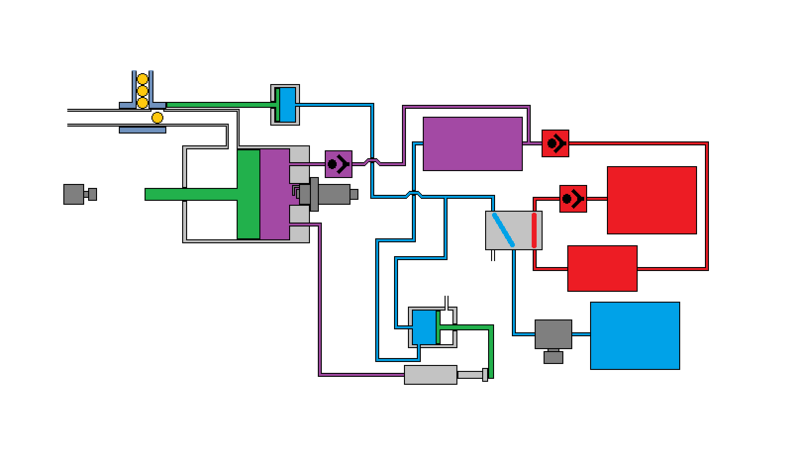 Speaking of theory, I imagine a piston engine. and I compare it with this type of combustion chamber system. Actually I do not think that the force exerted by the piston due to the expansion of the hot gases, differentiates as workload of the "engine", between a spring and a crankshaft to move. The more compression pressure the mixture is used, the harder the spring must be and the more energy it will need to be compressed. That energy is provided by hot gases, and there is no more. Personally, I tend to use cartridges with rupture discs, which consume much less energy from the thermal process to open the gas outlet channel, and especially much faster. That's why I commented in a previous post, that cartridges containing the ammunition, the rupture disk and the dose of fuel, would simplify the installation a lot, and more energy should be available to boost the ammunition. It's just an idea. with a rupture disk, like the first one I built. It's good design what you propose Jack, I'm studying it, and I'll comment if I can do something like that, within what I can build. I'm going to try to include an o'ring in the firing barrel, to retain a little more or a little less the ammunition. I've thought of something simple like the diagram. With the adjustment of the thread, I think to regulate the retention because the o'ring closes in the center when it is compressed. I imagine that it will improve in terms of regulation and strength. I'm not sure this would be a superior solution to using the projectile as the pop-off element, as long as you intend to use regular shapes like BBs. In this case it was a failure, because the second BB blocks the o-ring while the first one is still in the barrel and much hilarity ensues but you will not have this problem in your system. All right. I can build on what we are talking about. It is more or less as simple as what I have already manufactured. The auxiliary cleaning piston spring must overcome only the resistance of the ring. The ignition can be included in this cleaning piston. It seems to me an important improvement to leave more energy available for the shot. The other "solution", that of including the ring to retain the ammunition, does not solve the problem of excessive energy expenditure that we are talking about. Otherwise, I refer to the general system, it remains the same. As soon as I can, I'll get to work. Thanks Jack for the ideas and advice. You should finish that saga. You have everything tested to make a semi-automatic hybrid with its "hybrid cartridge", and it has carried out the tests of loading and ejection of cartridges ... it does not lack almost nothing, just put everything together to adjust, regulate and test. That would be something new, that I did not try so far because of the limitations on tools and budget that you know. You can achieve it, without a doubt, I do not know if you are interested in doing it, but YOU CAN! jackssmirkingrevenge wrote: I agree that using the projectile as a "burst disk" in a detent would probably be the simplest way to implement this. Any energy spent moving the piston is energy that is lost. The critical part would be ensuring that the projectile is more or less airtight so that no gas can flow around it. Did you make a rifle with this scheme? The system could be simplified, using the auxiliary piston rod to move the ammunition loading system slider. 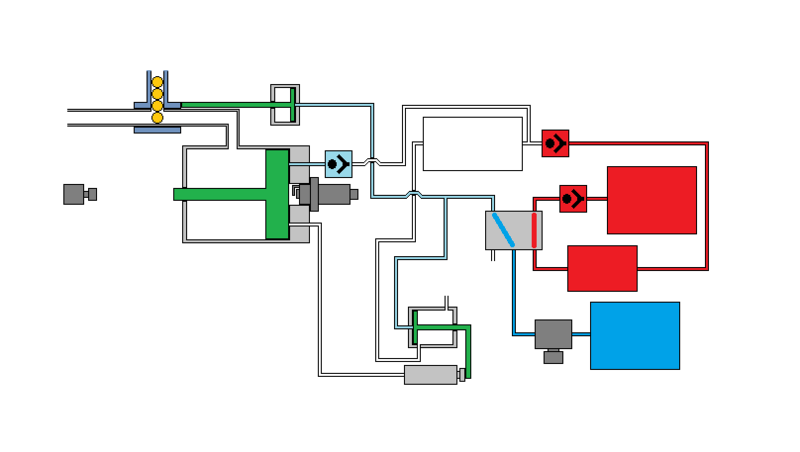 Without the mechanical actuator, the air consumption will be optimized, (which is the basic reason why I have chosen to use springs and not a pilot air chamber). The ignition can be included in the same auxiliary piston. The back cover of the combustion chamber can have a regulator to vary the compression of the spring, "R" in the diagram, and play with this to achieve that there will be at different pressures, to optimize this theme. keks2033 wrote: Did you make a rifle with this scheme? Not specifically but it should work, a constant air flow would be wasteful but probably work as a full automatic. 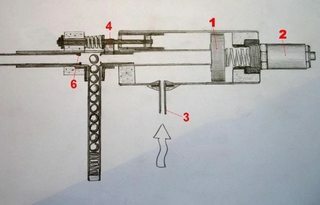 hectmarr wrote: The system could be simplified, using the auxiliary piston rod to move the ammunition loading system slider. I don't think I've ever seen it implemented though. Cute design It may be possible to use the auxiliary piston rod to open and close the burnt gas outlet valve as well. The two little actuators disappear. I have not analyzed it yet but I think it is possible. hectmarr wrote: I have not analyzed it yet but I think it is possible. I meant that once you have access to real powder-burning firearms, the inspiration to emulate the function of firearms using combustion based cartridges is lost.